By John W. Dean – The New York Times. Donald J. Trump wasted no time in seizing on the unprecedented letter that the F.B.I. director, James B. Comey, sent to Congress on Friday, regarding the bureau’s investigations into Hillary Clinton’s emails. “This is bigger than Watergate,” Mr. Trump’s team tweeted just a few hours after the letter was made public. It’s not the first time Mr. Trump has made the Watergate comparison. In fact, he’s been saying it regularly since the arrival of his new campaign manager, Stephen Bannon, in August. And that’s fitting — Mr. Bannon came from Breitbart, the conspiracy-minded right-wing news site, and his Hail Mary strategy seems to be to paint Mrs. Clinton as a criminal mastermind. And who better a measuring stick than America’s most infamous president, Richard M. Nixon? But these comparisons are nonsense. Only someone who knows nothing about the law, and the darkest moment of our recent political history, would see a parallel between Nixon’s crimes and Mrs. Clinton’s mistakes. The Watergate scandal, for the record, began on June 17, 1972, as a bungled burglary by men working out of Nixon’s re-election committee, who were arrested in the Democratic National Committee offices at the Watergate complex in Washington. It ended more than two years later, with Nixon’s resignation on Aug. 9, 1974, followed by the criminal trial of his former attorney general, John Mitchell; his former White House chief of staff, H. R. Haldeman; and his top domestic adviser, John D. Ehrlichman, who were found guilty of perjury and obstruction of justice on Jan. 1, 1975. Along the way, some four dozen Nixon aides and associates were convicted of or pleaded guilty to criminal misconduct, including me. Whatever mistakes Mrs. Clinton made, her actions bear no similarities whatsoever to Nixon’s criminalization of his presidency, and his efforts to corrupt much of the executive branch. As Nixon’s secretly recorded conversations show, he rejected the advice of his lawyers at every stage of Watergate; he was determined to do it his way. When he was forced to resign, or be removed from office by the impeachment process, he never truly apologized. Once out of office, he claimed he did not need the pardon he accepted that precluded his criminal prosecution, and he went to his grave claiming he was innocent of criminal behavior, absurdly asserting when the president does it, that means it is legal. Still, the efforts to draw a comparison between Mrs. Clinton and Nixon by Mr. Trump and many Republicans are telling, for several reasons. But there was never a Watergate commission (presumably he means the House Judiciary Committee), and she wasn’t fired — I know, because I asked the man who supposedly did the firing. This is more than an innocent mistake. 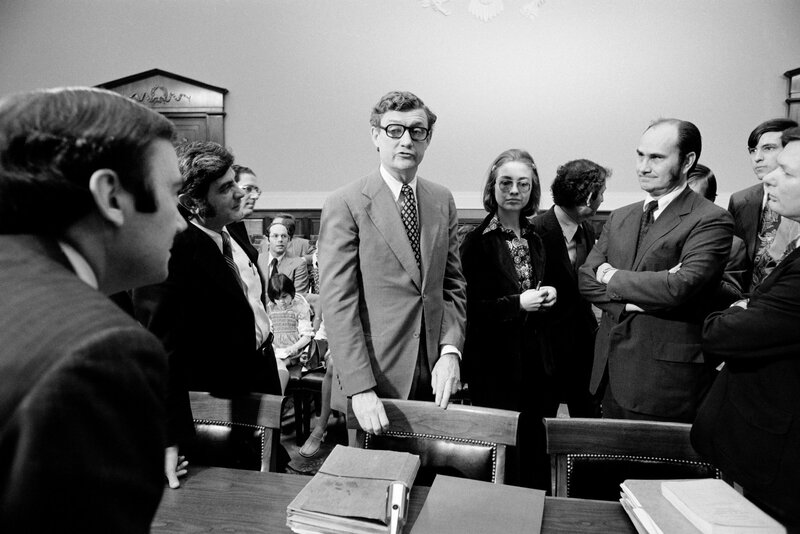 The idea that Mrs. Clinton was fired from the committee during its impeachment inquiry of Nixon is a mainstay among right-wing conspiracy-mongers. Restating it is playing to Mr. Trump’s base, even if it fell flat for the Al Smith audience. Second, Mr. Trump’s insistence that “Emailgate” is worse than Watergate serves to divert attention from the fact that, in my opinion, Mr. Trump is remarkably Nixonian, perhaps even more so than Nixon himself. I say that because while Nixon’s dark and nasty side, largely hidden from public view, got him in trouble, he was also a man of intelligence, with a strong understanding of government, a deep knowledge of the world and a heartfelt vision for lasting peace. If Mr. Trump has such positive qualities, he has kept that side of him well hidden, while giving free rein to his dark and nasty worldview. None of this is to say that Mrs. Clinton did not make mistakes with her email server. But to compare them to Watergate is more than historical ignorance. It distorts our understanding of what actually constitutes an abuse of power, and raises the risks that we will someday install another leader who is all too happy to misuse historical memory to indulge a dark and nasty nature.